Stress relief balls are so popular!!! Perhaps its because today we have so much stress in our lives - we suggest our Heart Shaped Stress Ball with Logo to hand out to customers as a really great promotional freebie. Great for taking the edge of things, and to help stop fidgeting and biting nails - the Heart Shaped Stress Ball with Logo has a lovely soft feel to it, its both calming and comforting. Customisable with a 'pad' printing method, you can personalise this item to ensure a good effective promotion and exposure of your company name is provided, alongside a fun desktop promotional item. 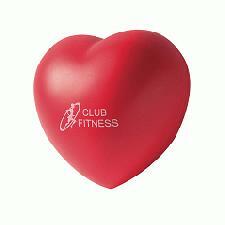 Why not have one of these Heart Shaped Stress Ball with Logo on your customers desk? we'll be able to help you.